SUNTURNS are a Norwegian super-group devoted to Christmas, featuring members of Making Marks, Moddi, The Little Hands Of Asphalt, Monzano and Einar Stray Orchestra. 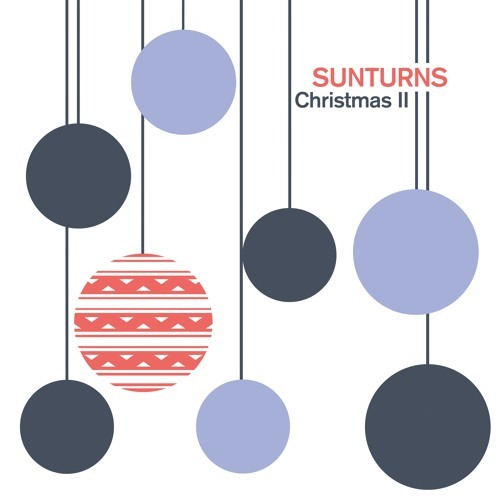 The new Sunturns album Christmas II is not a normal Christmas album. Consisting of 10 original Christmas songs and one Ramones cover, five of Oslo’s finest singers, musicians and songwriters join forces once again to portray their take on Christmas. The songs, inspired by everything from My Bloody Valentine to A-ha, sung both English and Norwegian, delves in to Christmas, combined with family fights, death, emptiness, an amateur tennis champion, expensive beer, the axial tilt, shopping malls, nostalgia and forgiveness. Shimmering guitars, snow filled piano lines, gentle strings, springy vocals and dynamic drums - all steady conducted by Sunturns’ very own Sjur Lyseid in the producer’s seat. While 2011’s debut was full of humorous, festive charm Christmas, Christmas II is a much darker and more adult affair. The bands’ all along gravitas is clear throughout: the sound is more mature, more electric and tighter. Having written none of the songs on the first album, youngest band member Einar Stray can claim credit for half the Christmas II songs, while Ola Innset has successfully written his first Christmas songs in Norwegian. The album was recorded in the summer of 2015 deep in the woods of Sweden in the legendary Silence Studio, with guest appearances from Ofelia and Hanna of the Einar Stray Orchestra providing string accompaniment. The Axial Tilt is the first track taken from the album, reflecting on the eventual parting of December’s despair as the sun finally turns and the days start to get longer. Would You is released as a single on October 31st, just as the lonely and desperate winter nights draw in as you reflect on your teenage emo self. Sunni is a piano ballad that evolves in to a post-rock tune about meeting a girl called Sunniva, and is the final single taken from Christmas II, released on the 21st of November. And all good Christmas albums need a murder ballad about an amateur tennis champion in Bergen, right? [Mount Kenya] Sunturns consist of Eivind Almhjell (Psyence Fiction/Monzano), Jørgen Nordby (Moddi/Making Marks), Sjur Lyseid (The Little Hands Of Asphalt), Ola Innset (Making Marks) and Einar Stray (Einar Stray Orchestra/Moddi). The band christened themselves Sunturns, harking back to the pre-Christian celebrations marking the winter solstice; the point the dark Norwegian days start to fall back and give way to the light. The seasonal band formed back in 2011, under the direction of Oslo based label Spoon Train. They immediately recorded and released their debut album Christmas to rave critics among Norwegian press, and went on tour in Norway and England to spread their somewhat different Christmas gospel. With both serious and humorous songs about many of the holiday’s backsides, the album became a hit record amongst indie fans both in Norway and abroad. The single The Sun Turns was listed on Norwegian radio station NRK P3’s official Christmas list and has been played heavily every December since. Sunturns’ come together once a year for an annual Christmas show in Oslo, and is for many a dear festive tradition. New album Christmas II is released on vinyl, alongside 2011’s album Christmas on vinyl for the very first time, in a double LP package in a gatefold sleeve, including a download code of both albums. 18 original Sunturns tracks and covers of Low’s Just Like Christmas, Swearing At Motorists’ Losing Mine and The Ramones’ Merry Christmas (I Don’t Want To Fight Tonight) make up this double album package.